After getting my certifications for AWS, I had the feeling one of the most fundamental tools in working with AWS is CloudFormation (CF). It lets you define your whole infrastructure in code so that you can apply version control to it. It allows you to tear down all the resources with one command, so you don't pay for anything when you were playing around. It allows you to define your infrastructure in one account and reproduce it in another without much hassle. On my journey to becoming a full-stack developer, I discovered a book by Agus Kurniawan called Learn CloudFormation. The book as a straightforward structure. I liked that the book isn't too long, but gets the most critical parts down. Kurniawan doesn't waste much time and gets straight to business. He stars with a short explanation of why someone should use CF and then motivates it with a simple S3 project. Then he explains the different methods of working with CF, like the AWS console and the CF CLI and always uses code-examples in JSON and YAML. While there are no specific chapters for the examples, every chapter has them. The parts that stood out the most for me were chapter 4 and 5. Most books on CF I read didn't talk a bit about StackSets or AWS Lambda. StackSets are a way to deploy resources to different AWS regions from one CF template. Multi-region deployment isn't a problem that many companies face, but it's nice to see a book address it. 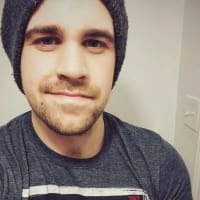 My primary resource of learning AWS Lambda was through the special serverless frameworks AWS created, and they always try to abstract away most of the complicated CF code that needs to be written. While this book doesn't go much into detail about the configuration, it at least shows some good examples on how to get Lambdas set up. It even tells how to use them with StackSets. It's only my preference, but when writing a book for developers, I probably would have ignored the AWS console entirely and maybe focused on JSON or YAML and not both. Since I wrote a book myself, I can understand the problem. On the one hand, you want to write concise, on the other side, most publishers won't sell a book that only has 50 pages, even if it gets its readers up and running faster than any other book. The other point I didn't like was the lack of details in some places. If the redundant parts (console+CLI, JSON+YAML) were cut out and the rest filled up with some details until the book reaches 200 pages, it would have made for a much better book. 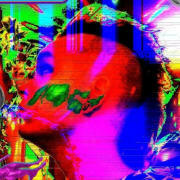 By courtesy of the author I have a tutorial for you, so you can make yourself a picture of his style. 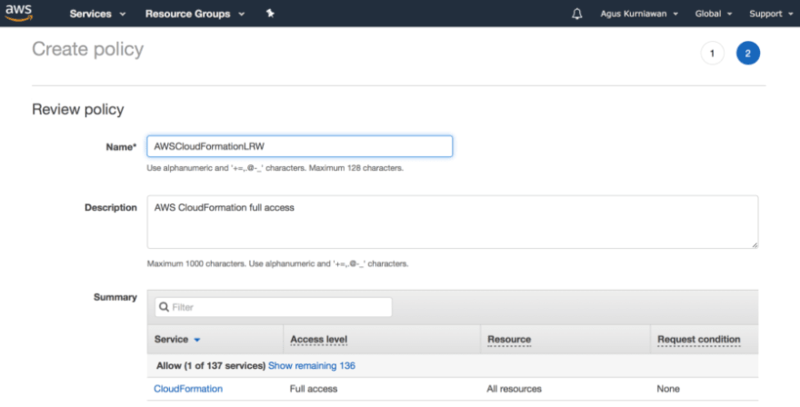 Learn how to implement a CloudFormation project using the AWS CLI by Agus Kurniawan. You should prepare all the required access and secret keys. It is recommended to read the guidelines on this. The next step is to configure security access on the AWS CLI to enable working with CloudFormation. To work with CloudFormation from the AWS CLI, you need to configure your security access and rights. In this demo, you’ll learn to build and deploy CloudFormation with Amazon S3, so you need to configure security settings for CloudFormation and Amazon S3 on the AWS CLI. Open a browser and navigate to the AWS IAM management console. 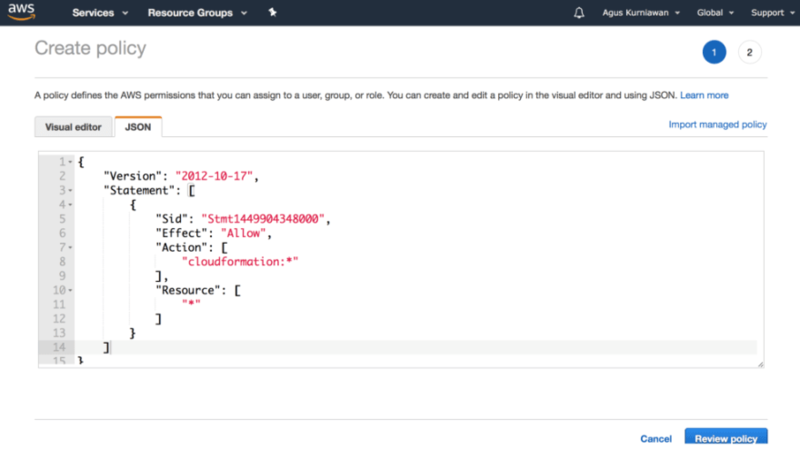 Now, create a custom policy for CloudFormation. Click on Create policy, which is indicated by the arrow in the above figure. Then, you should have a policy form, as shown in the below figure. Once you have pasted the scripts, you can click on the Review policy button, and you should see the form shown in the below figure. Once done, click on Create policy to start creating a policy. Now, continue by adding that policy to your account. Click on the Users section in the menu on the left and select the user account that is used in the AWS CLI. Now, your IAM user has a CloudFormation policy with full access. sing the same approach, you also need to add the AmazonS3FullAccess policy to your IAM account. 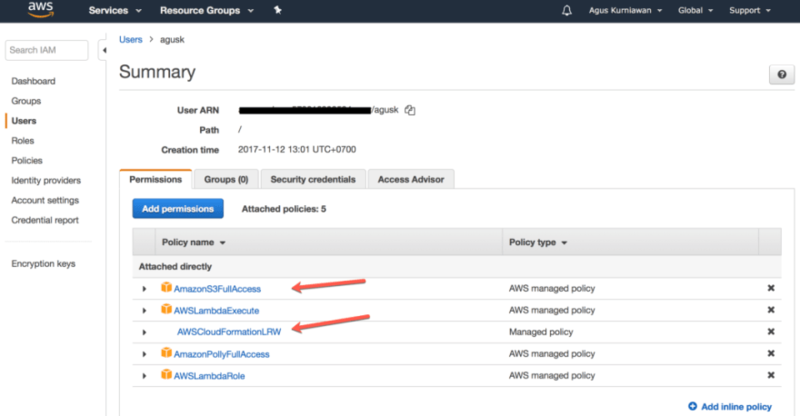 Select the AmazonS3FullAccess policy and then add it to your IAM user. Now, you can manage CloudFormation from the AWS CLI. The next step is to build CloudFormation and then deploy it to AWS CloudFormation. Now, you can use the AWS CLI to deploy AWS CloudFormation. To work with CloudFormation in the AWS CLI, you need to know some CloudFormation commands. Here you find all the commands for CloudFormation. Use the same hello-cloudformation.json template as in the first demo. You’ll upload this template to CloudFormation and then deploy it. --stack-name mystackcli1: This defines the stack name. In this case, the stack name is mystackcli1. --template-body file://./hello-cloudformation.json: This is a template file. You should use file:// with the full template file path. In this demo, Terminal has already been navigated to a directory, where the ./hello-cloudformation.json file is located. --debug: This is a parameter to enable verbosity, so you can see all the verbose messages from the CLI. If this operation is executed successfully, you should get StackId on the Terminal. To verify that your operation is complete, you can use the list-stacks command from the CloudFormation CLI. Here you find further information about the list-stacks command. 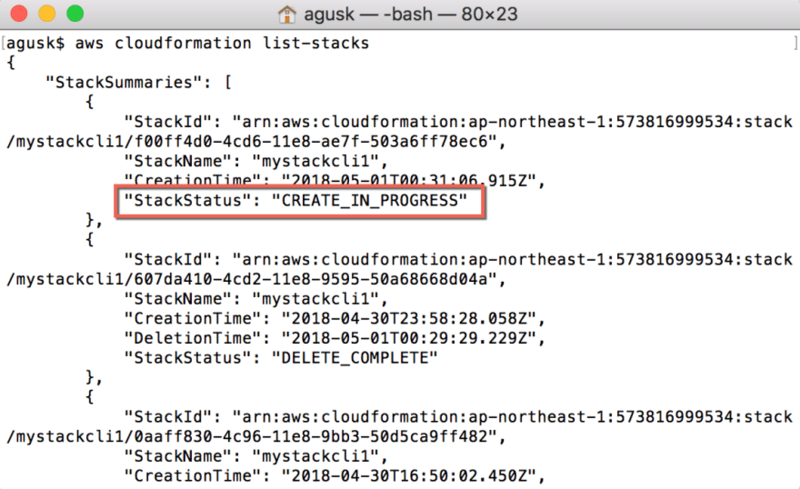 If you found this article interesting, you can explore Agus Kurniawan’s Learn CloudFormation to get up and running with AWS automation using CloudFormation. Learn CloudFormation serves as a fundamental guide to kick-start your CloudFormation journey.